AN internet disucssion with Pete reveals that the upper two pitches of this route were done by Pete Gallagher and Peter Williams, with me doing the lower pitch as an access. What follows is a description plus why I was confused as to who had been on the upper crack prior to me. If the last pitch is indeed part of the Southwest, then the book also calls it A3+. Not so on the modern scale, though I admit it is very hard to determine what will hold and what won't in entrad... so much to figure out. Anyway, the route ascends the south ridge then traverses north east across a big ledge and some very soft stone to an anchor below the southwest corner. This corner had been climbed once, maybe twice, but it was very long ago. The pin scars already had varnish in their tracks. The name of the route should imply a combination of pitches from other ascents and goes with the name of the tower. The Etesian Wind is a Greek wind that was prayed for during Xerxes invasion of Greece. The Etesian helped wipe out the Persians at the Battle of Salamis in 480 BC. P1 - 5.9/A1 - 120 Ft. - Start on the west face below the saddle that separates the tower from the smaller tower to its south. Ascend a loose chimney of Dewey Bridge to the saddle, then pass two bolts on dusty free climbing. Move left, then right around the arete (drag?). The rock gets solid, then degrades as you get higher. I aided the crux as I was by myself, but I'm guessing it would go free at mid 5.10... soft. Watch for lots of loose rock at the top. On the big ledge find an old bolt and pin in the shale stone just behind the big boulder. P2 -5.6R - 35ft. - The talcum pitch...Traverse the bedding seam in the east face to the first corner. There is an anchor here. Gear is questionable. Watch out that the big block below the anchor so doesn't spill off with you on it. P3 - 5.9/A2 -100ft. - Go up the overhanging, thin corner of Entrada on lost arrows then small angles. This may now be possible, after my ascent, on #4,5,6 HB's, at C3. It had been climbed perhaps one or two times prior to my ascent, but that had to be a long time ago as the scars were varnished. The crux is the thin stuff right off the belay, then the pods up higher. Plan on doing one 5.9 stack move on soft rock at the very end. I set the route up to rap with new anchors. I had planned to install chains on the summit, but alas spaced them (in the pack) and thus left a cordolette with biners. It seemed the pulls should have been easy, but I had a lot of drag, perhaps because the rope had slipped into the crack. This might be a piece or two heavy, but better too much than too little. Take many #4-#6 HB Offsets if you wanna try and do it clean. You need a few large nuts and many slings plus 2 X 60 meter ropes to get down. Ben on the R rated second pitch traverse. Etesian Hookup on Aeolian Tower. Thanks for the update. I changed the FA info to indicate so. Nice job on that pre-micro-cams. I felt the same way about the first moves off the ledge, but then when I cleaned the pins I realized I wasn't gonna fall... they were in pretty good. However, if one did blow, the fall would leave a mark. My first pitch is 20 feet right of yours, I'm guessing. I did it as one pitch, but I had a 60 and you probably had a 45 or 50. Fun to see this route posted and learn more about that tower. Dave Goldstein and I did the direct east face (Howling Winge) sometime in the 90s. We climbed the lower blank face, well to the right, in two short but hard pitches (especially the first) to reach the midway band. Then a very hard overhanging blades crack straight up; you can see the crack where it gets wider in your photo. Dave took several falls trying to clear the bulge and was held by (I think) a TCU in the roof; otherwise he would have been falling onto the belay anchor over and over. Well, probably only once...we probably would have bailed after just one of those falls! We traversed left on the fourth pitch and then climbed that soft, white stuff a bit to the right of the final corner on the Gallagher route. More hard and weird climbing. When we did this, there was a fixed rope on the lower east face, tied to a two-bolt anchor that has to be very near the one you put in. Someone had started a route left of ours, probably aiming for the Gallagher crack system. They put in five or six protection bolts, if I remember. (We used only one protection bolt in our first two pitches, or two if you were to combine the first two pitches and count the anchor midway.) Anyway, we rapped from the top of the tower to that mystery anchor and then to the ground. Brad and I climbed this on Sunday and definitely had some rope drag issues on pitch one. Make sure to pad the lip of the ledge. That rock is SHARP! On pitch 3 the pin right off the belay pulled out with my finger tips and I hammered it back in, but after this I didn't nail. For gear we brought what Sam suggested but also brought loweballs, and some bigger cams. Pete, we have different memories about those drilled pins. I recall tying them off after we placed them. Perhaps the rock has eroded some, but I don't remember them being in even close to the hilt. We named the spire the Aeolian Tower because the wind was so bad that we couldn't communicate at all, except by tugging on the rope. But on the final pitch (climbed as Pete describes, in one lead from the big ledge) the rope drag was so bad that even tugging on the rope didn't work, either. In fact, near the end of the pitch I tried to use a Friend with the cams too spread, ripped it out, took a short fall, and Pete never even realized I'd fallen. Evan Deis and I climbed the tower on 5/21/16. I had previously climbed the first pitch using easy aid up to the saddle, followed by free climbing and a few more points of aid up to the large ledge on the south prow of the formation. This time, Evan free climbed all of pitch 1 by stemming up bulges, with inconspicuous but somewhat decent protection. Getting up to the saddle is definitely the sketchiest part of the pitch (if done all free). From the ledge we decided to test our luck going left. The traverse pitch is harder, and much more exposed than getting out on the east face, but it is pretty well protected and still pretty simple. We built a gear anchor at a good stance at the bottom of the crack, under an overhang with a fixed pin about 15' up. 3rd pitch was easy aid in a beautiful dihedral until it got wide at the top then it was a grovel to the summit. There was one tricky move off the anchor, otherwise the aid is very straightforward and entirely clean. The free climbing up the last 40 feet is mostly offwidth and a bit strenuous, but no harder than 5.10. Evan free climbed the 3rd pitch on top rope, cleaning all of my gear along the way. He hung a couple of times, but managed to climb pretty much the whole pitch. If someone put the time and effort in, it seems like the pitch (and entire route) would go free at 11+ or 12-. The 3rd pitch looks like a spectacular free climb for those who have the ability and interest. 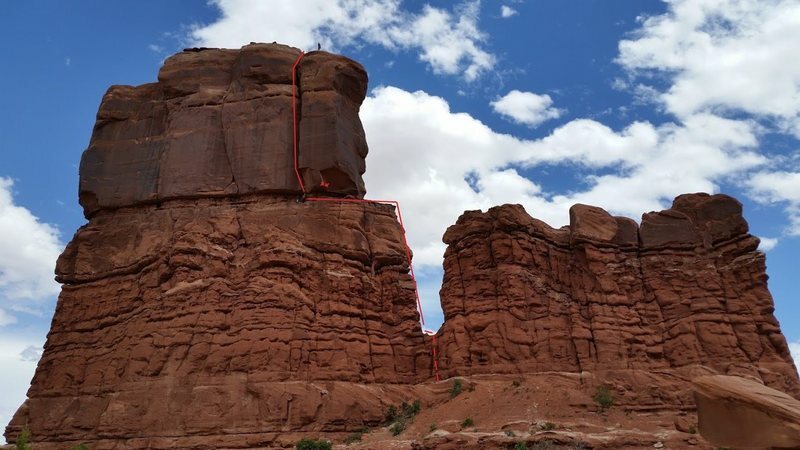 I haven't gone back to check out Desert Rock II, but it looked like the first ascent took a more direct (and burly) line from the ground on the West side of the tower; there is a drilled angle anchor 20ft below where we built our gear anchor after the P2 traverse. Definitely no need for a hammer on this one. A triple set from .1 to .75 Camalots or the equivalent, a double set #1 - #4, one #5 and #6, and a couple offset aliens should get the job done easily. It looked like rapping directly off Sam's cold shuts would result in horrible friction when pulling ropes, so we left a cord and a couple of biners.